I’m really not a big fan of store-bought or even most restaurant pesto. Something about it tastes stale or old…just not fresh. Maybe they make it too far in advance, dentist maybe they heat it up too long before they use it. I’m not really sure – there’s just something off about it. I’m lucky enough to live in a place where I can get fresh, local basil all year long. But most of you have likely been on a fresh basil hiatus for a few months. There’s no better way to welcome it’s arrival at the farmers market than fresh, homemade pesto. Instead of the usual pasta, I dressed some garlic-sauteed shrimp in the fresh pesto. Nestled on creamy Parmesan polenta and topped with crisp pancetta, this is one of my new favorite recipes. It’s bright and fresh and summery, but still hearty. It’s like a fancy-pants shrimp and grits. I love it! Make the pesto by pulsing the ingredients in a blender or food proccessor until all large pieces are gone. If you don’t have either, mince the garlic and basil as finely as possible and combine with the other ingredients. Set aside. Place the water, polenta and salt in a large sauce pan and set over high heat. Once it comes to a rolling boil, cover and reduce the heat to medium low. Let cook for 25 – 30 minutes, stirring occasionally. When the polenta’s done, stir in the Parmesan cheese and adjust the salt level if necessary. While your polenta cooks, place a large skillet over medium-high heat and add the pancetta. Cook the pancetta until it begins to brown and crisp. Remove to a paper towel-covered plate with a slotted spoon. Discard the drippings (mine were too smoky to cook the shrimp in) and wash your skillet. Add the olive oil the skillet and return to the heat. Saute your shrimp until just opaque, then add the garlic and saute for another minute. Remove from the skillet and toss with 1/4 cup of the pesto. 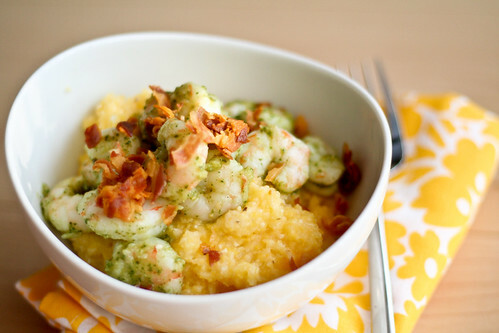 Spoon the polenta into bowls, top with shrimp and sprinkle with pancetta. Serve immediately. As much as we love polenta, we definitely love pesto too. There are a lot of good things going on in one bowl. looks like something I’d order at a fine dining restaurant! I love pesto with shrimp or scallops. I hate to use my entire basil plant to make pesto, so I just buy it at the market and make a batch! Sometimes premade isn’t bad, but it depends on who made it! This looks really good! May try it tonight . . . thanks! What a great (alliterative) recipe. This really does look delicious. holy moly this looks delicious- and for british people who cook with ‘prawns’ not shrimp, it’s even more alliterative! i’ll be making this soon for sure. This really looks like my perfect meal. So many great flavors there! I made this and added a sunny-side-up egg on top for a delicious breakfast/brunch two weeks ago. It was amazing!! I’ve also used this pesto recipe three times since–everyone comments on how good it is and can’t believe it’s sans parmesan! Thanks a million, Mel! I will be making it many more times–especially when guests are in town. I also wanted to add that I used the already-cooked organic polenta (mashed it up and heated it in a sauce pan with a little water and olive oil) and it turned out terrific. I tried this out last night for supper, and my husband and I both really enjoyed it! A ton of great flavors in one meal. Thanks for the recipe! Two of my favorite foods together! I love shrimp and pesto. I think I will have to give this one a try! tried this for lunch today, one of my guests is gluten free so I was looking to use Polenta instead of Pasta. I used my own pesto recipe and proscuitto as i did not have any pancetta. Die anschlieÃŸende Mal, wenn ich Sprachreisen a Blog Ich hoffe, dass es enttÃ¤uscht mich, wie doesnt viel wie dieses. I bedeuten , ich weiÃŸ es war meine Wahl, um lesen , jedoch I wirklich dachte youd haben etwas interessant zu sagen. Alles, was ich hÃ¶re, ist ein BÃ¼ndel von Jammern Ã¼ber eins, dass Sie wÃ¼rden fix , wenn Sie werent zu beschÃ¤ftigt passieren Suche nach Aufmerksamkeit.